Faces of Thedas: Yvette? Really? Hey folks, this is Jack here to talk a bit about Faces of Thedas. Now no big book of characters can include every character in a large universe. You can look at our various offerings in DC Adventures, Wild Cards, A Song of Ice and Fire, and now Dragon Age to see this. The books include a lot of characters and groups, but not everything makes it into a particular book. So who makes the cut? Well, it depends. In Faces it was an intentional mix. 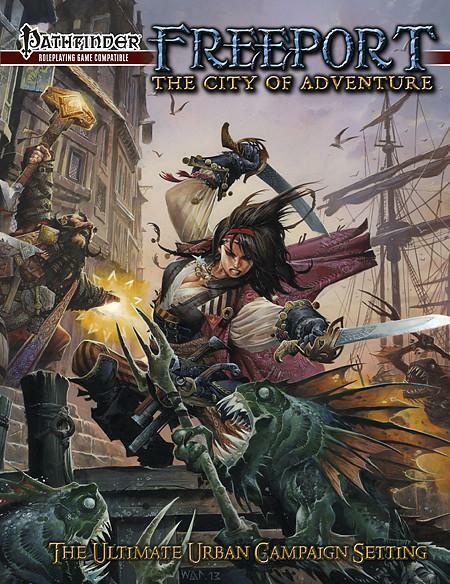 The prime focus was on “quest givers”, people who enabled adventures and roleplaying opportunities for players, not who necessarily had their own adventurers. This is where characters like the Divine, Josephine Montilyet, and others came in. But not all the characters fit exactly into that category. 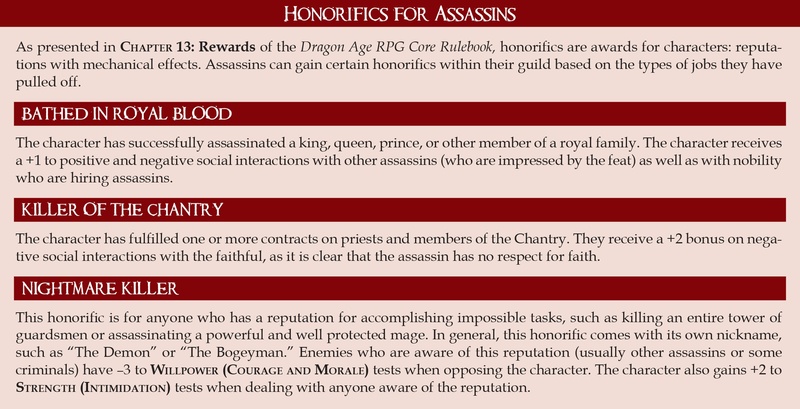 In many cases, characters were selected with a fair amount of wiggle room in how they could be used, often because they had targeted, and important but limited involvement in the canonical tales of Thedas. Other characters were included because they would make potential romantic interests, allies, and patrons. These included some companions from the games, like Leliana. This also included characters with ties to important groups or events that still had that aforementioned wiggle room that makes them easier to throw into a campaign or adventure. Some characters were also included because not including them was never an option. Be it Bioware or one of the several Dragon Age fans on our staff, there were characters people inside the production of this book wanted to see. 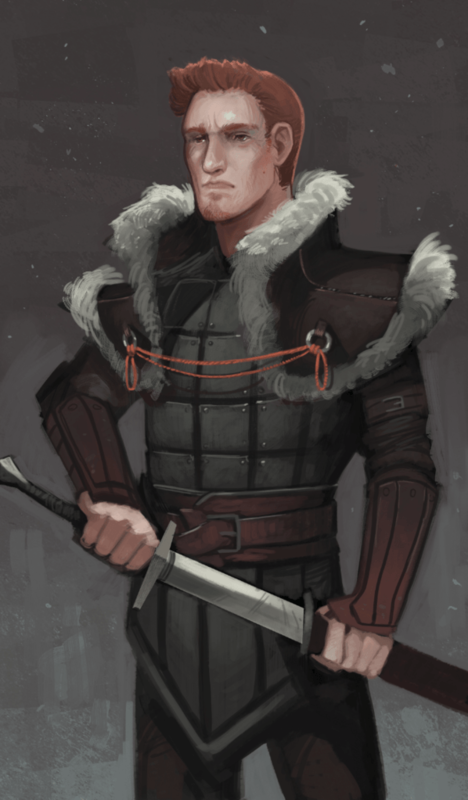 This is also your Alistair, but also your Dorians and Cullens and so on. With a few characters—very few admittedly—it was even the case someone in on the production side didn’t want to use a character in the book. Sometimes that person was me, but not always. I’m not going to detail who those characters were, but it was never a matter of “ugh, I don’t like them!” but some other reason that seemed compelling enough to use a different character. So what about some of the folks who didn’t make it? It’s not that they couldn’t fit into one of these roles. Its not that they weren’t cool or no one liked them. It was just they didn’t make it for various reasons. For example, I actually like Fenris a fair amount. However, Fenris’ tale is pretty self-contained, socially isolated, and during Dragon Age 2 its quite possible he ends up dead at Hawke’s hands. So instead we had characters like Iron Bull or Michel—skilled passionate warriors with a story whose net cast a bit wider plot and campaign wise. Note a lot of this was clearly “in our opinion.” That’s the thing about design, there’s always an element of personal, even arbitrary decision making. I’m not trying to thumb my nose and say, “well when you’re developer you can fix it!” but…there is a much less confrontational and more good-natured truth to that. Not everyone will agree about what to include in a product. And in case anyone is really wondering? I like Yvette. Yes, she’s a minor character who arguably “doesn’t matter”. I also think she makes a good romantic foil and political connection for campaigns who could grow and develop in response to interactions with a player group. So now you know. https://greenronin.com/wp-content/uploads/2017/08/GRR2811_DA_FacesofThedas.jpg 589 455 Jack Norris //greenronin.com/wp-content/uploads/2017/07/RoninBanner-1.png Jack Norris2019-03-04 07:45:062019-03-04 07:45:06Faces of Thedas: Yvette? Really? 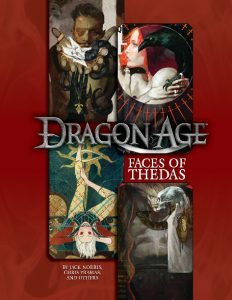 So the long awaited Faces of Thedas supplement for Dragon Age has just released and is available for print+pdf pre-orders. When I say “long awaited”, we ain’t kidding. From the fans to the writers to myself and the other folks at Green Ronin? We’ve been waiting for this book to come out for some time. I’m not going to do dissection of the various delays and problems that led to the long development cycle. From tragedies to simple delays to approvals…it was a long road. But now that road is reaching its destination so let’s look at what that means. Faces of Thedas is essentially a character archive/NPC cast book for Dragon Age. It doesn’t include every character in the games and novels, that was never really its purpose. Instead it takes various characters and organizations and provides additional information about them, including advice on how to play them, game statistics, and suggestions on how to use them in a game. These characters range from relatively minor but politically interesting characters like Yvette Montilyet to major players like Leliana and Cullen. Some characters are more likely to be plot movers and allies, others PC heroes will likely meet over a five course meal of swords, arrows, daggers, spells, and blood. The book covers characters across all three games and various other media, which also means not ever character from a particular game, comic, book, etc… made the cut. This wasn’t due to some disregard for some fine characters who didn’t make it, there was just so much space and some other character for whatever reason was included instead. What reasons? Honestly? I can’t tell you. Because there wasn’t just one. Some characters were deemed interesting, but their stories seemed more confined to a particular game, making them less likely to feature into tabletop campaigns. Others seemed to be statistically easy to replicate compared to another option, thus it was decided a character like Cole who didn’t follow normal character creation patterns would be more useful to model than someone like Lord Harrowmont, who for all his skill at intrigue and wonderful dwarf-y lordliness is mechanically a dwarf warrior who knows how to play politics. That’s nothing against all the Harrowmont fans out there, I like him too. 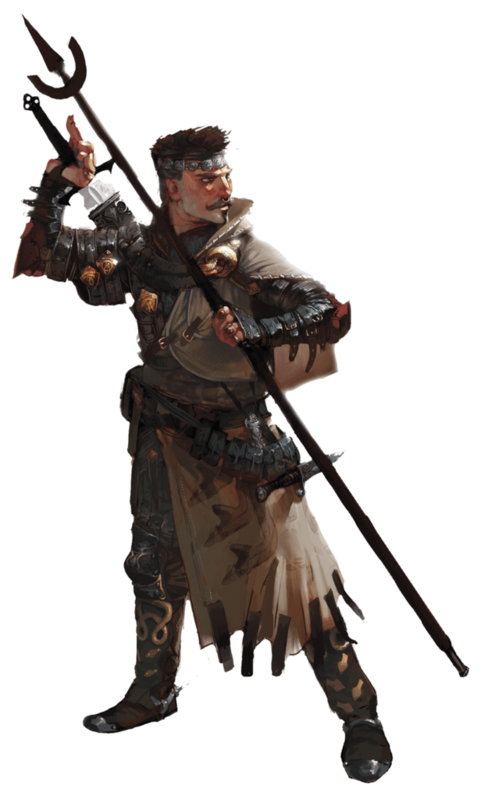 However, I’m also confident most Dragon Age GMs wishing to use old Pyral can make a serviceable version of him for their games. Speaking of Cole, here’s a preview of what he looks like in Faces. Note the background for playing incarnated spirits and the special Talent—these are the sorts of “extras” which sometimes pushed a character’s inclusion. See? Now you its even easier to play your reformed killer drawn back into a John Wick* style rampage of righteous revenge in Thedas! These are the sorts of things Faces was meant to enable, not just a catalog of characters, but a guide to using those characters easily and effectively. Information on the Carta, Friends of Red Jenny, and other organizations was similarly aimed at helping players and GMs alike. All told, there are dozens of characters and groups collectively in the group. This includes four new backgrounds and numerous titles and honorifics and rules for relationships. It’s a fine resource for Dragon Age tabletop players and fans of Thedas alike. We hope you enjoy it as much as we do! *The Keanu Reeves films, not the game designer. Inspiration: You can use the existing canon as a springboard for your own storyline. Use of existing characters and events gives you a healthy pool of stories, personalities, and ideas from which to create a foundation for a great campaign. This also creates an immediate level of recognition for you and players familiar with The Expanse series. The trade-off is that you are bound to those portions of the canon you incorporate into your game. For example, if you decide to use Miller as a major NPC in your game, you are limited to a certain periods of time where that would be possible, and you have to be aware of Miller’s ultimate fate (and the fact that your players may know it as well) unless you choose to change things. If you do, you might find it messes with the players’ expectations. That can be a good thing or a jarring and unpleasant experience. Flexible Canon: You can use canonical elements in your game, such as the setting or past events, but choose to change some things that might conflict with your planned storyline and allow the player characters to significantly alter canon through their actions. All of the major components can remain prevalent, such as the major factions and locations, but with tweaks in the events that follow. What if there were more survivors of the Canterbury? What if the player characters were the ones hired to track down Julie Mao—or were hired in addition to Star Helix and Miller? 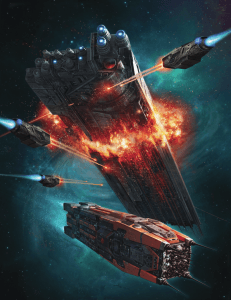 What if your story involved the crew of the Rocinante as major NPCs? 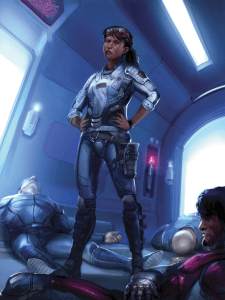 The “flexible canon” approach is generally the one we have taken with the Expanse RPG: Things are as described from the books, at least initially, but the potential exists for the player characters to change things. Otherwise, there wouldn’t be much tension or excitement for their story, would there? Ignore Canon: You can bypass canon altogether, or base your story around events with little to no effect on existing canon. The Expanse setting is vast and you could tailor stories and events that barely even touch the established canon outlined in the fiction. An entire campaign could focus on a crisis on one of the many different stations, or center your story on an exploration crew traversing the outer planets. Whatever you decide, make sure if your players are aware of existing canon, they are also aware of any important changes you make to avoid confusion and clashes of expectation. In addition, if you do alter major events, be aware of the chain-reaction it may have on other events and characters down the road. The Expanse RPG tweaks the damage system from the AGE System a bit by changing Health to Fortune, a measure, not of how healthy and durable characters are, but how lucky and “important to the plot” they are (the durability aspect gets covered by a Constitution-based trait called Toughness instead). The “ablative” qualities of Fortune remain the same: players spend it in order to reduce or mitigate the damage their characters suffer. If an attacker rolls 10 points of damage, a player can spend 10 Fortune points, and the character escapes any serious harm—that time. Of course, players can also spend Fortune to improve their characters’ chances of success with tests and, sooner or later, their luck is going to run out. If Fortune isn’t enough to completely spare a character from damage, then it is going to hurt. The character is either going to be taken out (see the following) or needs to take an injured or wounded condition to reflect the remaining damage. If the character accepts an injured condition, the damage is reduced by 1d6. If any damage remains, or the character is already injured, the character must accept a wounded condition next or be taken out. If the character accepts a wounded condition, the damage is further reduced by 1d6. If any damage remains, the character is taken out. Once a character has the wounded condition, any damage that gets past Fortune takes them out. If damage remains after applying Toughness, Fortune, and taking an injury or a wound, then the target is taken out of the encounter. The attacker may choose to impose any one condition reasonable for the type of attack which takes out the target. So, for example, an attacker may choose to take out a target with a gunshot and leave them dying, just wounded, or even just unconscious. The key point is that the attacker decides on the target’s condition. An Expanse character can also choose to roll over in an encounter. In essence, the character’s player chooses to take that character out of the encounter, except the player chooses the character’s condition, subject to the approval of the GM, rather than leaving their fate up to their opponent. Rolling over is a “live to fight another day” tactic for when it’s clear a character is overmatched and doesn’t have much of a chance otherwise. You can only roll over in an encounter before you are taken out. Once you begin applying damage from an attack that has the potential to take you out, it’s too late to roll over, so choose carefully. If you want a slightly more lethal Expanse game, consider the following option: In any situation where one character has another “dead-t0-rights” the target character cannot spend Fortune to eliminate damage, all damage must be accounted for with Toughness, injuries, or wounds, and any excess results in the character being taken out, as usual. Standard situations where a character is dead-to-rights include being completely surprised by an attack (such as shot by an unseen sniper, for example) or having the helpless condition, completely unable to avoid an attack or hazard. It’s up to you to define situations that leave a character dead-to-rights, and to tell the players in advance. For example, if you want them to respect guns, make it clear that having someone holding a gun on you means they have you dead-to-rights, unless you can somehow distract their attention. This means characters will probably be less likely to rush armed opponents, for example. Try to use this option as a tool to help the players make informed decisions about the risks their characters take. 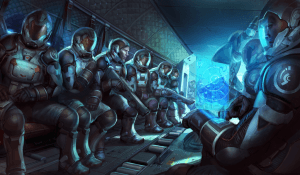 The setting described in The Expanse RPG is just after the events of the first novel, Leviathan Wakes, but that doesn’t mean you have to set your game at that point. You could go back to the beginning of Leviathan Wakes and tell a story that runs parallel to the adventures of the crew of the Rocinante, or even have your player’s characters take their place. Alternately, if you prefer, you could run a game set in the period of the later novels, or a time much earlier when humanity is first leaving Earth. The core Expanse RPG book doesn’t provide source material for either of these possibilities (though you can expect to see later history covered in future Expanse RPG books) but that shouldn’t prevent you from doing what you want. The early history of The Expanse is ripe with campaign and adventure possibilities. The novellas Drive and Butcher of Anderson Station offer insights into history before Leviathan Wakes. The early expansion and colonization of the Belt offers a lot of potential stories and adventures. Rival companies vie for influence and control. Newly established colonies in the outer planets smuggle in the goods and supplies needed to survive. The early days of the expansion from Earth and Mars are much like the Wild West as humanity spreads out into the solar system in search a new and better life – anything to escape the overpopulated cities of Earth. The novella The Churn describes the crime-ridden, overpopulated city of Baltimore. Crime bosses and their “families” smuggle weapons and illegal cybernetic implants while engaging in all-out war with the authorities. Players could be part of one of the underground smuggling operations or the desperate authorities trying to stem the tide of crime. Corporations vie for power and influence as humanity reaches out to colonize asteroids, moons, and planetoids throughout the solar system. Early pirates prey on ships that travel the vast, empty spaces between worlds. Most of the early pirates are essentially privateers in the employ of corporations, using the greedy and morally compromised to do their dirty work for them. The Outer Planets Alliance (OPA) springs from the wants and needs of the citizens of the planets beyond Earth and Mars. The Belters find themselves perilously close to slavery since they are dependent on resources controlled by Earth. The characters could be early members of the OPA struggling to keep the people of the Belt free and dreaming of a day when they control their own destinies. The Butcher of Anderson Station is a perfect example of the conflict between the OPA and the inner planets. Future supplements for The Expanse will explore the events of Caliban’s War and beyond, but don’t let that limit where and when you set your stories. The struggle for power continues as humanity travels out into the stars. For the time being, stories in this time are up to the GM. You could use the novels as inspiration, telling stories that run parallel to those in the books, or the characters could take the place of the protagonists in those novels, but with the opportunity to take the story in their own direction. You could also choose to go in a completely different course with the story. The Expanse RPG does look at some of these possibilities, including a number of “beyond canon” series concepts where the protomolecule does something quite different, or ends up somewhere else altogether. The Expanse Roleplaying Game takes the popular science fiction universe of The Expanse fiction series by James S.A. Corey (starting with the novel Leviathan Wakes) and brings it to tabletop gaming using the Adventure Game Engine or AGE System. 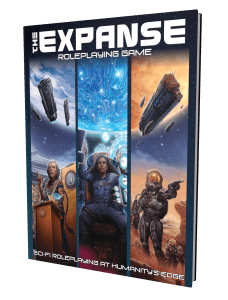 You may well have heard about The Expanse RPG during our wonderfully successful Kickstarter, and may have even backed it then. In that case you have our thanks and the opportunity to check out a lot of existing previews. There’s also The Expanse Quickstart available to download for free. As the game will also be going into pre-orders soon, we’re going to preview a few more things to give you a look at what you can expect from it. 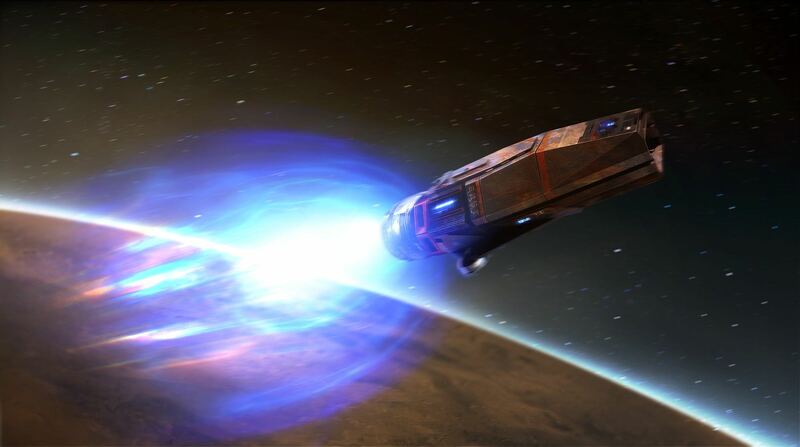 Combat between ships in The Expanse is similar in some regards to combat between characters, but on a much larger (and often slower) scale and more simultaneous in execution than character-scale combat. A round of space combat tends to be a bit longer than a round of character-scale combat, upward of a minute or so, although the exact time is flexible, as with character-scale combat. It’s long enough for all of the ships involved to execute all of the steps listed previously. At the start of each round of combat, the character in command of the ship makes a TN 11 Communication (Leadership) test. If successful, the commander generates 1 Stunt Point, plus additional SP equal to the value of the Drama Die, if the roll contains doubles, much like a Stunt Attack action. The commander may spend SP generated from the command test on other ship combat actions that round. This is an exception to the general rule that SP must be spent immediately—they can apply to any test by the ship’s crew that round. However, other tests by the crew during that round do not generate SP, only the commander’s initial test. Once a new round of ship combat begins, any unspent command SP from the prior round are lost, and the commander makes a new command test. These stunts are used by ships in space combat. 1+ (Core) Guidance: You grant a +1 bonus to a chosen ship combat test this round for each 1 SP you spend. Choose one of the following: maneuver test, electronic warfare test, evasion test, point defense test, or damage control test. 1+ Blinding Maneuver: You maneuver your ship in such a way as to blind or limit an opponent’s Sensors. Each SP you spend reduces an opposing ship’s Sensors score by 1 (to a minimum score of –2) until the start of the next round. 2 Multi-Targeting: Your ship’s point defense cannons (if any) can both attack and defend this round without any penalty. 2+ On-Target: Every 2 SP you spend increases the TN of tests to evade your ship’s weapon attacks that round by +1. 2+ Tactics: Every 2 SP you spend increase the TN of an opposing ship commander’s next command test by +1. 3+ Evasive Action: Every 3 SP you spend grants a +1d6 Hull bonus to your ship that round for resisting damage from successful weapon attacks. 3 Perceived Weakness: You increase the damage of one successful weapon attack by 1d6. This stunt is a risk, as it has to come in Step 5 of the round, and requires a successful hit. 4 Precise Hit: One of your successful weapon attacks results in an additional Loss, even if the target’s Hull completely eliminated the damage. 4+ Set-Up: You maneuver an opposing ship into a hazard, such as a normally shorter range weapon, a field of debris, or even a floating rock. This stunt is considered a weapon attack inflicting damage dice equal to half the SP spent (round down). The Set-Up can be evaded; the TN is 10 + your Intelligence + Leadership focus (if any) + half the SP spent. So if a character with Intelligence 2 and Leadership spends 5 SP on this stunt, the TN to evade the Set-Up is (10 + 2 + 2 + 2.5, rounded down to 2) or 16, and a failure on the evasion test results in 2d6 damage to the target ship. Welcome back to our look at Green Ronin’s 2019 plans. If you missed the first two entries, you can check them out here and here. In this final installment, I’ll be talking about Modern AGE, Fantasy AGE, and Dragon Age. All three of these games are powered by the Adventure Game Engine (AGE), which has become something of a house system for us over the past five years. 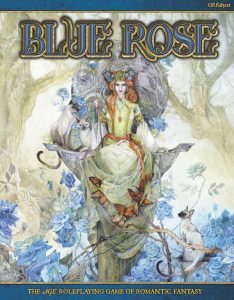 Blue Rose and our upcoming Expanse RPG also use AGE, so if you play any of these games, you’re learning the core rules of a growing group of RPGs that cover a variety of genres. I originally designed the Adventure Game Engine for the Dragon Age RPG, and it took off from there. I’m thus happy to report that Faces of Thedas, the long-awaited sourcebook for Dragon Age, is nearly here. Once we get the final green light, we’ll put the PDF up for sale and launch the pre-order. The hour is nigh! 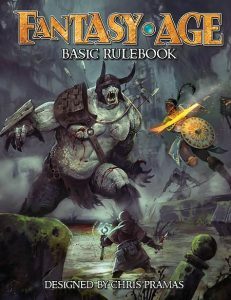 Last year we released the Fantasy AGE Companion, the first real rules expansion for the game. We are following that up this year with two books to make running Fantasy AGE even easier. First up is the Campaign Builders Guide, which is designed to help Game Masters create, build, maintain, and run campaigns. It is filled with advice on crafting encounters and adventures, creating interesting monsters and locations, running epic-style campaigns, and more. It also includes tables to help generate campaign elements when a bit of spontaneity and randomness is desired. After that we have a book called Lairs, which provides a series of detailed challenges you can adapt to your Fantasy AGE campaign. Each chapter presents a terrifying or formidable adversary, their servants and followers, and their headquarters, base, or lair. Also included are rules for lair and scene specific stunts to step up location-based action in your game. Between Lairs and the Campaign Builders Guide, Game Masters will have many new tools to work with. Later in the year we should have a setting book for Fantasy AGE. Jack Norris and Jaym Gates have been working on a new setting and you’ll hear more about that as the year progresses. We do also still hope to release the Titansgrave world book, but that depends on some things beyond our control getting sorted out. Can’t say any more than that but fingers crossed. 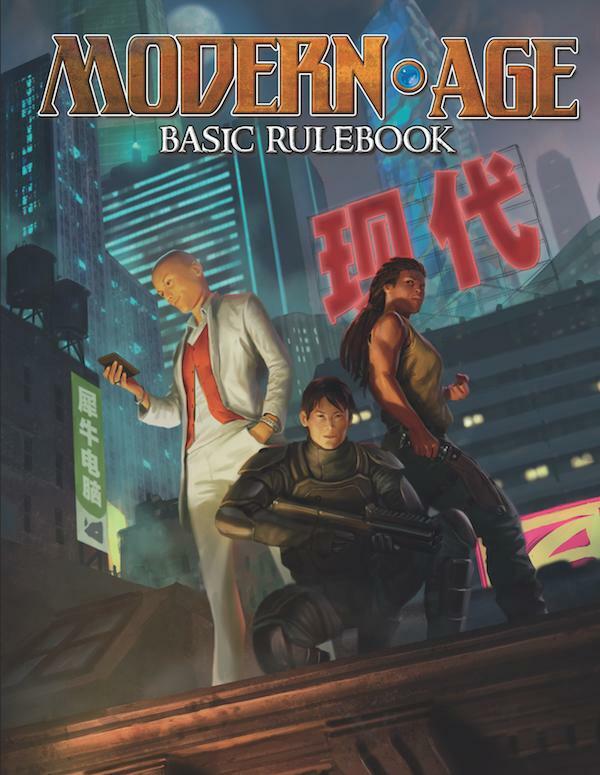 Last year we launched the Modern AGE RPG, releasing its Basic Rulebook and GM’s Kit. As its name indicates, this takes the AGE rules into a contemporary context. You can use it to run anything from the Industrial Revolution to the near future. Optional rules for extraordinary powers mean Modern AGE easily handles things like urban fantasy or fighting occult Nazis as well. Just last week we released The World of Lazarus, the first campaign setting for the game. It’s a dystopian near future setting based on the Lazarus comics by Greg Rucka and Michael Lark and it’s a great way to get your Modern AGE campaign going. If you’d like to know more about The World of Lazarus, developer Crystal Frasier did a series of Ronin Round Tables about it that you can find here. Next up after The World of Lazarus is the Modern AGE Companion. This sourcebook expands the Basic Rulebook in a bunch of fun ways. There are new backgrounds, professions, and talents, plus new rules for extraordinary powers, technologies, and organizations. It’s also got a very useful chapter on adapting the rules to various genres, such as gothic horror, alien invasion, and Cold War spies. Summertime will then see the Enemies & Allies sourcebook. 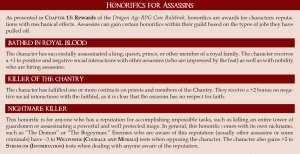 If you’re looking for adversaries and NPCs for your campaign, look no further! Since Modern AGE covers many different genres, Enemies & Allies ranges far afield, from elite operatives and scientists to horrors and arcane beings. Later in the year we are going big with our first original setting for Modern AGE, Malcolm Sheppard’s Threefold. It’s an epic modern fantasy setting where characters explore countless planes of existence. In it, our Earth is only one of many alternate worlds. Beyond them, the Otherworlds contain dimension-spanning empires of godlings and sorcerers, and Netherworlds ruled by demon-gods raise armies of the damned. 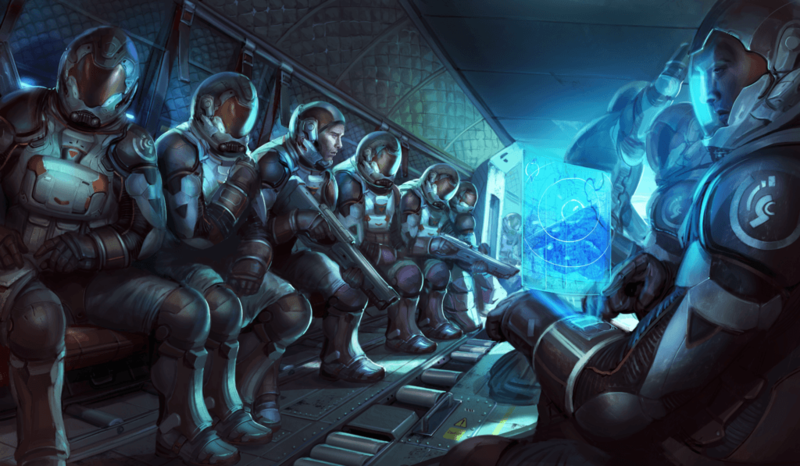 Characters might travel between planes as agents of the Sodality, an organization devoted to peacekeeping and exploration, defend Earth as cyborg agents of Aethon the conspiracy which patrols multiple timelines, or serve other groups. Threefold is big by design, and broad enough to contain all of Modern AGE’s genre possibilities. Stay tuned for more info and teasers about Threefold throughout the year. All in all, 2019 is shaping up to be a great year and there’s more to come. Look for an announcement about our community content program for Fantasy AGE and Modern AGE soon. As always you can keep us with us on this website, Twitter, or Facebook. We’ve got more fun stuff to reveal as the months go by. Here’s hoping 2019 is better for everyone! 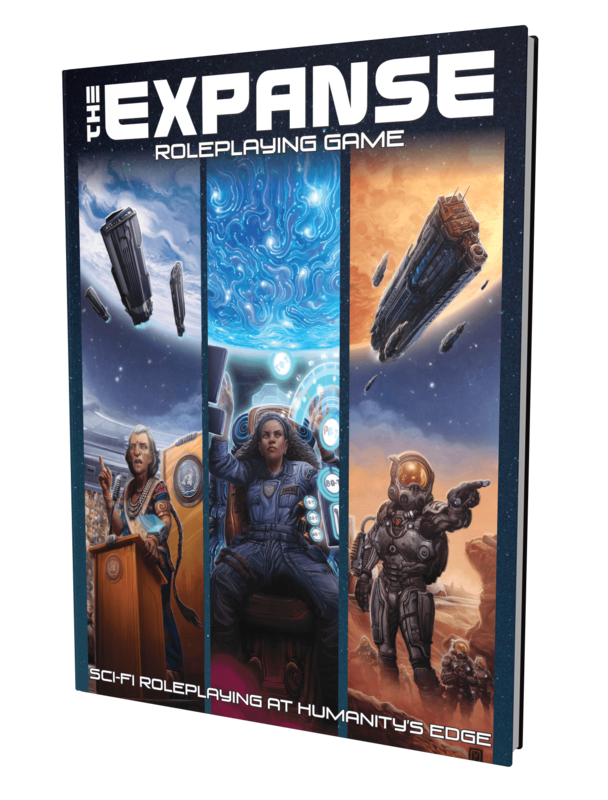 The Expanse Roleplaying Game takes the popular science fiction universe of The Expanse fiction series by James S.A. Corey (starting with the novel Leviathan Wakes) and brings it to tabletop gaming using the Adventure Game Engine or AGE System. 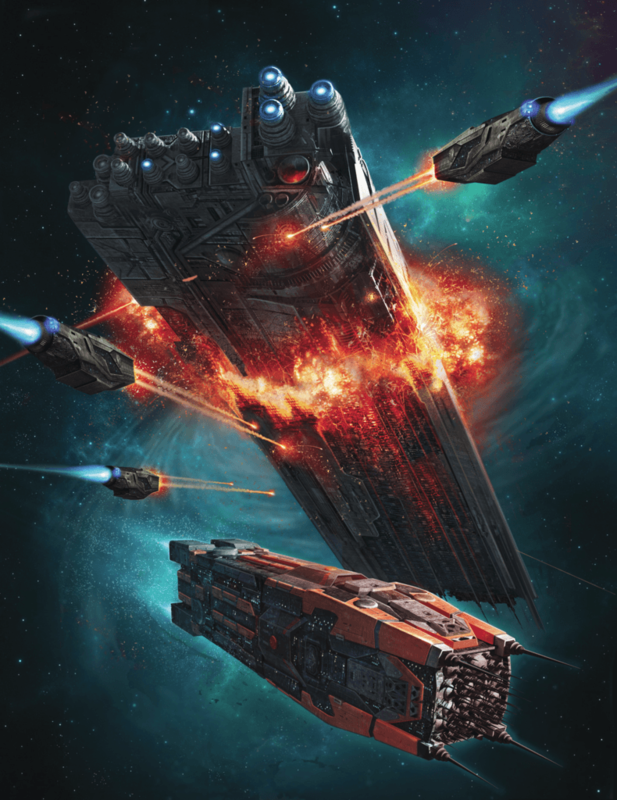 You may well have heard about The Expanse RPG during our wonderfully successful Kickstarter, and may have even backed it then. In that case you have our thanks and the opportunity to check out a lot of existing previews. There’s also The Expanse Quickstart available to download for free. Now that the game is also going into pre-orders, we’re going to preview a few more things to give you a look at what you can expect from it. One of the most fearsome sights on the modern battlefield of the System is military power armor, like the Goliath suits worn by Martian Marines. Two and a half meters tall, and weighing 400 kilograms even before a soldier climbs inside, power armor provides both formidable offense and defense. Half armor and half spacesuit, the armor has radiation shielding sufficient to let soldiers walk through a nuclear bomb crater minutes after the blast. The armor’s titanium and ceramic-composite exterior shielding is typically painted in camouflage patterns appropriate to the assignment, and enemies are often surprised just how well an enormous soldier in power armor can blend into the environment when they stand still. The armor’s hydraulics system magnifies the wearer’s strength, much like a mech rig, and carries most of the weight of the suit, allowing soldiers in power armor to undertake marathon hikes and move surprisingly fast. They also enable the armor carry heavy weaponry, typically a rotary machine gun and sometimes a grenade launcher or micr0-missile pack. Sensor packages feed data to the wearer on the helmet’s HUD, allowing them to identify and track infrared targeting lasers used by opponents’ weapons, and even visually parse those weapons using the suit’s camera feeds to match them against an internal database. Those same cameras monitor in all directions, sending feeds back to squad officers and their military command center, which can monitor the life signs of both the soldiers and opponents who have been detected and attacked. All of the benefits of a vac-suit. +12 armor bonus with no armor penalty, so long as the armor is operational. +10 effective bonus to Strength and Strength (Might) tests. +2 bonus to Speed and +4 bonus to Constitution (Endurance) tests. An integral rifle doing 3d6 + Perception damage and capable of performing automatic weapon gun stunts. +2 bonus to Dexterity (Stealth) tests compatible with the unit’s camouflage. +2 bonus to Perception tests where the armor’s sensor package applies. If power armor loses power, it becomes massive deadweight, effectively leaving the wearer restrained and unable to use any of the armor’s systems. Maintenance: Power armor requires regular maintenance activities during interludes to remain in full working order (see Interludes in Chapter 5). 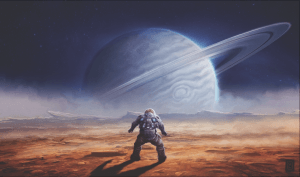 We’re creating an Expanse character for a game set in the Belt and the outer planets, and want someone with some experience aboard ships and stations. Let’s also focus on a character with some technical skills. Starting off our character, we make nine 3d6 rolls on the Determining Abilities table, giving the character the following scores: Accuracy 2, Communication 1, Constitution 0, Dexterity 2, Fighting 1, Intelligence 1, Perception 2, Strength 3, Willpower 2. Since we want more of a technical character, let’s swap the rolled Strength and Intelligence scores, for Intelligence 3, Strength 1 (you get the option of doing that). Since our game takes place out in the Belt, we decide to go with a Belter origin, although some of the characters may have different origins. We take note of the Belter traits; hopefully, the characters won’t be spending much time in normal gravity environments like Earth, Belters are hindered, even restrained, in heavier gravity. We roll 2d6 for our character’s social class, getting a 6. Consulting the Belter column of the Social Class table, that indicates Lower Class. Rolling a die on the Lower Class Backgrounds table, we get a 5 for Urban. Looking at the background, we give our character +1 Dexterity and choose the Misdirection talent, feeling like our techie is more cunning than athletic. Then we roll once on the Urban Benefits Table, getting an 8 for +1 Perception. Looks like we’re right! Looking at the Lower Class Professions, we immediately knows that we want Technician and choose that with the GM’s permission rather than bothering to roll. Looking at the description, we give our character the Intelligence (Technology) focus and the Novice degree in the Hacker talent. Looking over the drives, there are several appealing ones. Unsure which to choose, let’s roll randomly: We get a 5, indicating Column 2 on the Drive table, and then a 4, giving us Rebel, suggesting this character is a nonconformist who has gotten in trouble in the past. That fits. From this drive, we choose Improvisation to add to the character’s talents and Reputation for our improvement. Our lower class Belter technician has Income 2, not an extravagant lifestyle! It’s pretty clear the character just makes ends meet, and can be described as struggling. The character lives a lifestyle of cramped quarters and eating mostly kibble and cheap noodles, but does at least have essential technical tools and equipment, which are part of the starting character’s package. So our character’s starting Fortune is 15, unmodified because we applied the improvement from drive to Reputation. The character’s Dexterity is 2, giving us Defense 12 (10 + 2) and Speed 12 and Constitution is 0, so the character has Toughness 0. Sounds like our Belter techie is going to want to stay off the front-lines in a fight! Consider who our Belter techie is. Let’s say that she came up from a lower class background but her smarts and technical savvy helped her to make it. Unfortunately, she occasionally needed help from less than legal elements to get what she needed for her education and repaid them with the occasional favor. Now she wants to get out from under the thumb of said criminal elements and go legit, but opportunities are thin. Longer-term, she wants to change the system that kept a smart Belter kid from realizing her potential without having to work the black market, although she’s not sure that she agrees with all of the OPA’s politics, particularly the more radical or violent factions. As a low-class Belter and hacker, our character has plenty of opportunities to make both friends and enemies. She may know fellow Belters, have run into characters with lower class or criminal backgrounds, or who worked security or some other job that brought them to her part of the station. As a hacker, she may know some characters from online interactions, maybe some who think she is someone else entirely, such as corresponding with another character with mutual interests, who doesn’t yet know their friend is a Belter with no formal education. We work out some more details of our character: We decided somewhere along the line that she’s a woman. Since she’s a Belter, we decide her heritage is a combination of Korean, Indian, and Brazilian in her more recent ancestry. Searching some online resources for suitable names, we come up with Isabella Anika Moon, known to her friends as “Izzy,” who is ready for her first adventure! https://greenronin.com/wp-content/uploads/2019/01/isabella-moon_1024.png 1024 507 Steve Kenson //greenronin.com/wp-content/uploads/2017/07/RoninBanner-1.png Steve Kenson2019-01-07 09:23:082019-01-07 09:23:08The Expanse: Character Creation!